No, this is not about a newly-discovered manuscript by Ian Fleming, revealing more amazing exploits of Agent 007 and his mysterious boss; it's about the even more mysterious subject of money; specifically, about how much of it will be needed in the coming free society. Some may feel that's rather theoretical, but I have little patience with such a view. If we are serious about obtaining a free society, we'd better get serious also about visualizing what it will be like (as well of course as about how to get one) and how some foreseeable problems might reasonably be overcome. A key thing about planning and preparation is that with them one may not achieve one's objective, but without them one will certainly not achieve one's objective. I encountered the puzzle while finishing up the writing of A Vision of Liberty earlier this year, but after asking a few experts on the subject and finding I was in unexplored territory, rather than digress then to attempt a solution, I just added a footnote and decided to reflect on it some more. This is the outcome, and there is plenty of speculation; I hope others will write to amplify the subject and clear some more of the fog. Today we're told we have in the USA a $14 trillion economy which is serviced by a $1.4 trillion supply of what the Feds pretend is money--counting just "M1", which is the stuff that circulates often. It's not true money, but there's no current alternative, so let's join the pretense for now. In addition, there are the various savings accounts which make up M2, shown by the same link to be $7.7 trillion, and then there's M3, which government stopped showing at all in 2005 but which this source estimates as heading towards $12 trillion; M3 includes large time deposits on top of M2. If that's correct, we have part of the explanation for the current mortgage meltdown: as the chart shows, M3 rose recently in some secrecy but to a large degree, and evidently much of it found its way to the well-known phoney loans bankers were pushing to home buyers who were not likely to pay them back, just because the Community Reinvestment Act forced them to do it. It's almost as if government wanted the current meltdown, so as to have an excuse to nationalize the commanding heights of the banking and finance industries . . . but no, surely not? Could they really be that devious? Now, after E-Day when government and its pet bankers have evaporated, the resulting free-market society will choose what media will serve for its money, and while anything at all will do, my bet is that the preponderant choice will be gold because of its long-established superiority for the purpose, aided perhaps by silver for small change. Recently the dollar price of gold was $750 an ounce or $24 per gram (equals $24 million per tonne), so assuming (to be very conservative) that at transition time the economy is still equal to 14 trillion 2008 dollars, the amount of gold required to service it all would be (12 trillion / 24 million =) 500,000 tonnes. Trouble is, there are only about 130,000 tons of gold above ground in the whole world; and the estimated remaining 50,000 tons yet to be mined, will take a long time to unearth. Supposing that Americans corralled as much as 10% of that total for the purpose of money here at the time of E-Day, there would be 13,000 tons available to do the work of those 500,000 tons--a shortfall of 97.4%. Oops! Put differently: the new, free America would have only 2.6% of the gold it needs . . . at the 2008 purchasing power of gold. Something, therefore, has to give--especially since the rest of the world will not stand by idle, as it watches America cast off the curse of government; gold will be in burgeoning demand everywhere else as well, as other societies follow our lead. 1. A golden fairy (or a modern-day alchemist) might wave a magic wand and create more - advised perhaps by a reincarnated (or centenarian) Alan Greenspan. No, thank you; that's too close to what government pretends to do. 2. The market might change its mind and pick something else for money - and to some extent, it will; all manner of honest certificates from reputable members of the market would suffice for exchange. Even so, the arguments in favor of gold (incorruptibility, inimitability, immutability, stability of supply . . .) are so strong that we're surely right to expect its predominance. 3. The gold money might circulate much faster than paper does today. But why? Customary use will make such changes very slow indeed--the Moon will go on circulating the Earth about once a month. People are used to paying invoices and salaries that often, and both individuals and companies will want to amass substantial savings to cover sickness and retirement, and those will circulate very slowly as now. People will expect there to be enough money to allow that to continue. 4. The real purchasing power of gold might greatly increase. That seems to be the only one left, doesn't it? Since that will therefore probably happen, let's try to understand what it means. It's quite a mind-bender. Recall, we're not considering here a simple increase in the dollar price of gold--that will happen anyway, as it has for the last century, and it will accelerate to infinity as E-day approaches and the government's paper dollar becomes absolutely worthless. Rather, we're looking at what seems to me to be an unprecedented change: the purchasing power of gold will rise considerably. Whereas the price of real "stuff" like a loaf of bread and a custom suit of clothes has been amazingly constant in gold terms for two thousand years or more, the prediction here is that those gold prices will decrease dramatically thanks to the natural limit on the metal's supply. This would be an historical "first" which will accompany the other historical "first"--the first-ever free society. How much of a price decrease? Perhaps as much as (100 / 2.6% =) 38 times, if the assumptions above were to apply, as they might well. In that case, the value (purchasing power) of gold in terms of 2008 dollars would be about (24 x 38 =) $912 million per ton, $912 per gram or $28,500 per ounce. 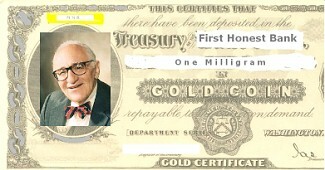 Notice, as Murray Rothbard observed, it does not matter at all that prices in that society will be entirely different (38 times lower, in terms of gold) nor what the supply of the chosen form of money may be; the number of digits in prices will automatically adjust. Even so, the adjustment will be amazing--and nearby is shown a preliminary sketch for the future approximate equivalent of today's dollar bill. I can't see any flaw in that line of reasoning, yet it implies that the true, free-market purchasing power of gold may be as much as 38 times greater not only than what we are used to, but also vastly greater than it has ever been! One ounce of gold "should" buy not just one custom suit today as it did 2,000 years ago--it should buy 38 custom suits. Hence my use of "unprecedented." Now let's check this a different way. Human ambition and ingenuity are such that, left unfettered by government, they reduce the real prices of things people buy; rivals compete to produce more cheaply so as to sell more and make more profit (and the pioneers succeed). Therefore, further assuming a stable supply of real money, over a couple of thousand years, one would expect a substantial drop in true, real prices. Yet prices in terms of gold--the nearest thing known to real money--have not decreased, but merely remained stable, as far as one can compare; and one can perceive two possible reasons: (1) more gold has been mined every year, so increasing the worldwide money supply, and (2) there has never been a free market. Let's consider each of these. Clearly, there was a great deal less than 130,000 tons of gold around in Roman times than today. That source says about 10 tons a year were then being mined, which would be 10,000 tons per millennium, so as a raw guess, let's say the supply was no more than one-fifth of today's, or 26,000 tons. Then ceteris paribus, prices in gold terms would have risen by a factor of five times in 2,000 years, i.e., 0.81% per decade, compounded. Now we can estimate the effect of there not being a free market during all that time; since we observe that a custom suit costs about the same now as it did then, it must be that economies and efficiencies resulting from 2,000 years of rising productivity have averaged only 0.81% per decade. This stands in huge contrast to what was observed during the century closest to free-market conditions--the 19th, in America . Then, a productivity increase of around 3% per year was normal--and that is 34% per decade, a rate more than 40 times greater. Same ballpark as the 38-times factor above. So perhaps we're on to something here. So, as well as suggesting how much gold will purchase in the coming free society, these two lines of rough estimation suggest that the human race would today be about 38 times better off had a free market prevailed since Caligula died. That's an almost unimaginable difference. It would mean first that a vast range of merchandise would be so cheap as to be virtually free, malnutrition would have been unknown for several centuries, the energy problem would have been solved by the Middle Ages, and things that cost serious money today might be given away as promotional freebies--while items now seen as luxuries would be available to almost everyone for a fortieth of their current price. However, that's by no means the whole story; it's not just that recognizable items would be absurdly cheap, but also that there would exist a whole range of goods and services that have not been dreamed of or invented yet. This has to do not just with the forced absence of a free market all that time, but with the forced suppression of free thought which laid, in ancient Greece especially, such a promising foundation for intellectual inquiry and progress. A thousand years of that progress were lost when the Council of Nicea, by combining the power of Church and State, closed down the possibility of building on that foundation--so dealing all hopes of an early free-market society a double whammy. Alas, we cannot change the past. But we can certainly change the future.